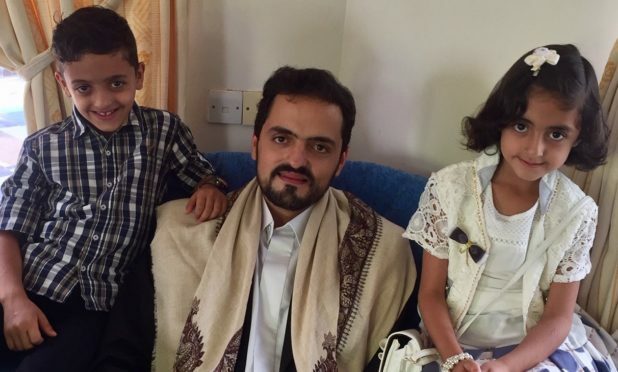 Adam Alakil, 29, has not seen his wife Hadeel, 25, son Hashem, 9, or daughter Tasnim, 7, since he left them in Yemen in December. Falkirk-born Mr Alakil is a British citizen and his children have British passports. However, his wife, who has a Yemeni passport, has been told she must travel to Sudan to pass an English language test before she can obtain a spouse visa. Mr Alakil plans to meet her in Khartoum, where anti-government protests have claimed lives, next month. He has enlisted the support of North East Fife SNP MP Stephen Gethins, who has written to the Foreign Office to ask for safe passage for the family. He said: “I go to sleep every night having said goodbye on the phone and hoping I will hear them again the next day. Mr Alakil said he was trapped in Yemen for two years after he went there to complete his family’s travel paperwork in 2014. The Kettle Produce worker escaped through the desert and returned to Scotland but now fears the family could become stranded in Sudan if the political situation there deteriorates. “We don’t want what happened in 2014 to happen again,” he said. “We can’t wait too long in Sudan as the situation there now is poorly and I only have four weeks holiday from work. Mr Alakil described living in Yemen as “extremely terrifying”. He said: “When I was there we were getting bombed all the time. A bomb hit about 20 metres from the house. “It’s affecting my family really badly. My son, he’s being brought up in a very violent environment. “I personally dragged a dead body from in front of our gate and washed the blood before my children saw it. That’s the reality of life there now. “Not one single day goes by without at least eight air strikes. Most are in the district where my wife and children live. Mr Gethins has written to Middle East Minister Alistair Burt MP requesting an urgent meeting to discuss how to ensure the Alakil family’s safe return to the UK. He said: “It is horrendous that the Home Office puts an English test before the safety of two young children, who have UK passports, and their mother. “They are stuck in a war zone and have to travel to Khartoum in Sudan, which is also dangerous, to see if their mother passes this test. An online crowdfunding page has been set up to help the family with visa and travel costs.